There’s still plenty of potential in Jet, provided it can modify its business model, or take that elusive one rupee seriously. All Jet Airways India Ltd. ever needed was 1 rupee, or just 1.4 U.S. cents, for providing hot meals and cold towels. Since even that modest goal has proven elusive, India’s longest-surviving private airline now needs bankers with spine to keep flying. It’s been clear for some time that Jet, falling behind even on pilots’ wages, was going to skip a debt payment soon. Now that a default on bank loans has finally happened, let’s spend a minute on the brutal economics of the missing rupee. As a full-service carrier, India’s second-largest airline spends that much more per available seat kilometer than its bigger rival, IndiGo. That’s excluding fuel costs, which are volatile and exorbitantly taxed but comparable for all players. The problem is that as 2015 was ending, Jet was earning only half a rupee more in revenue per seat kilometer than IndiGo. 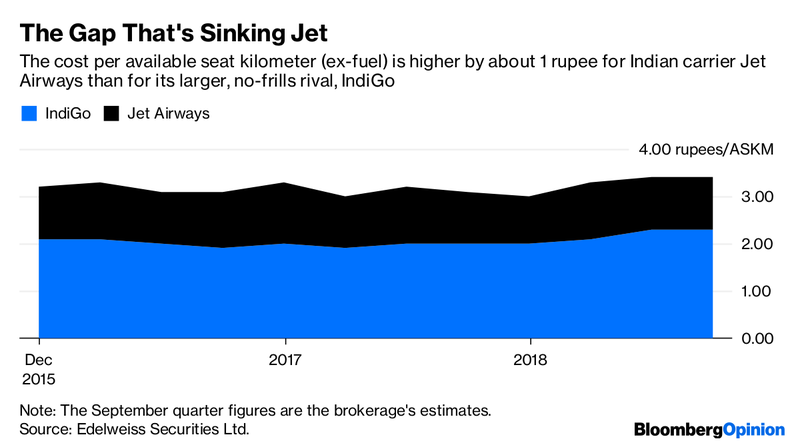 That was just before InterGlobe Aviation Ltd., the owner of IndiGo, set out to expand its scale of operations 2.5 times faster than what Jet could muster. The market leader also drove prices lower by forgoing revenue of 0.9 rupees per kilometer over the first nine months of 2016. Jet was too indebted to match its rival’s aggression. When it tried, by sacrificing revenue of 0.3 rupees per kilometer, it ended up charging customers less than it cost to fly them. Then, starting September 2017, oil prices shot up for a year. The whole industry was shaken, but Jet had already keeled over. The fuel-price surge has now receded, and the airline is exploring cost-cutting options. But saving $100 million a year on maintenance contracts won’t make the debt problem disappear: Repayments of as much as 63 billion rupees ($900 million) are due by March 2021. Of its fleet of 124 at the end of September, Jet owns only 16 planes that can be sold. Lengthening the working-capital cycle has its limits. Lessors have to be paid lest they take the aircraft away; employees have families to feed. A plan to monetize the airline’s privilege program hasn’t gone anywhere. Who’ll buy into Jet Privilege Pvt. when there are doubts about the carrier’s future? Speculation that the Tata Group could be a white knight has also waned. 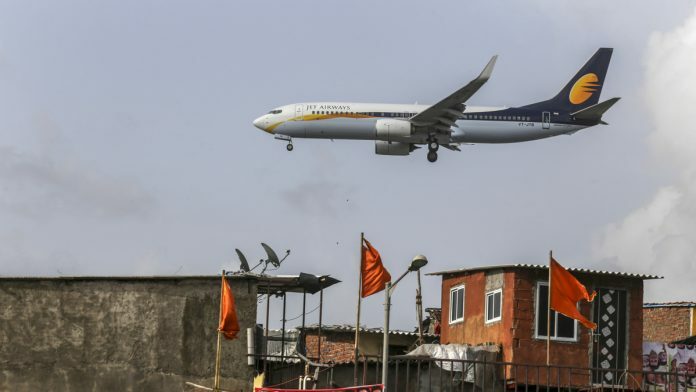 Nor is it clear if Etihad Airways PJSC — which must now regret picking up its 24 percent stake five years ago — would want to back Jet founder Naresh Goyal, the 51 percent owner, once again. The aviation market in the Middle East isn’t exactly brimming with optimism. There are probably only a handful of good options now. Either Etihad doubles down by making a fresh investment; or the board finds a new owner who infuses equity by diluting Goyal and Etihad. To succeed, both these approaches would need the real threat of banks referring Jet to the bankruptcy tribunal. Goyal would lose control of the airline involuntarily, yet the carrier would continue to operate with fresh super-priority funding (which will rank higher than existing debt). State Bank of India, the airline’s lead lender, is waiting for a forensic audit of Jet’s accounts. Time is not on its side: General elections must be held by May. The government of Prime Minister Narendra Modi won’t like the bad publicity from a collapsing airline so close to the polls. However, if state-run lenders take a haircut as part of a restructuring, opposition parties would pounce on Modi for causing losses to taxpayers to help private businesses. It would take a gutsy banker to do anything at all. Still, not acting urgently can do bigger harm. The 2012 unraveling of Kingfisher Airlines Ltd. provides a cautionary tale. 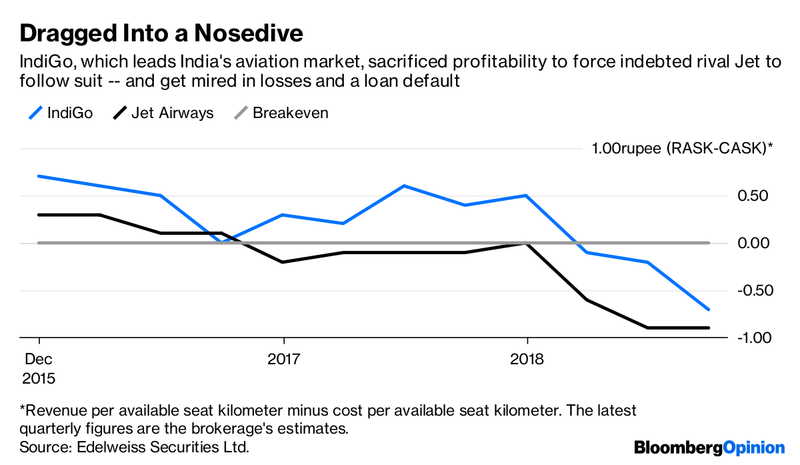 Left holding the worthless brand of the grounded Indian carrier, among other collateral, Indian lenders should know by now that a defaulted airline loses value exponentially if cash-flow woes make it defunct.